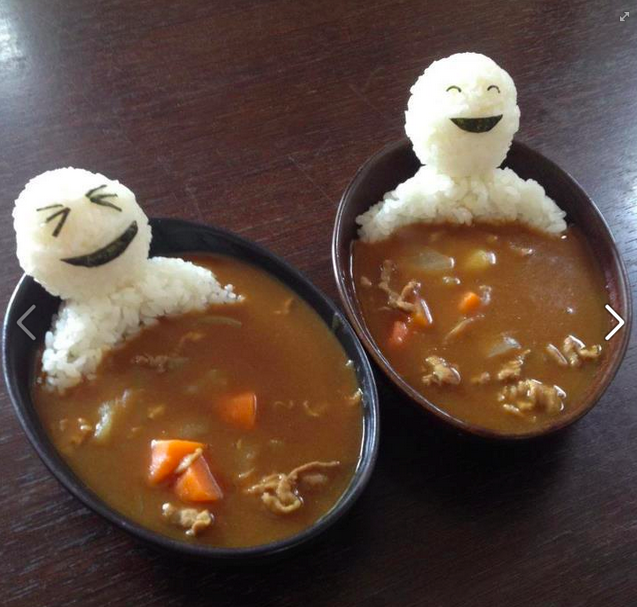 Rice people with nori faces, bathing in curry. This entry was posted in installation / sculpture and tagged bento, food on September 30, 2012 by jonathan. 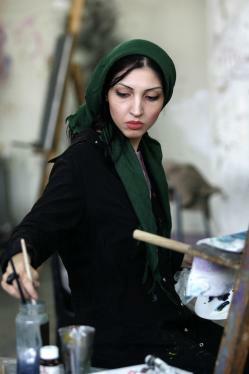 This entry was posted in photo and tagged artist, iran, painter on September 25, 2012 by jonathan. 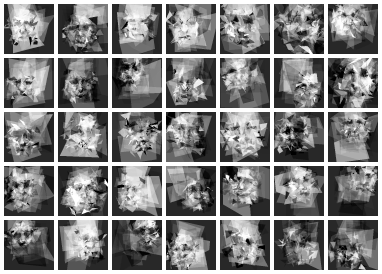 Philip McCarthy‘s Pareidoloop overlays semitransparent polygons until a human face is found. (github link) It’s inspired by Roger Alsing‘s Evolution of Mona Lisa, where he applied the same technique recreate the Mona Lisa. A more interesting variation of this technique would be throw the images through a classifier trained to recognize various religious images, print them on toast, and the post the toast to eBay Virgin Mary toast style. This entry was posted in tech and tagged computervision, pareidolia, philipmccarthy, religion, rogeralsing on September 23, 2012 by jonathan. 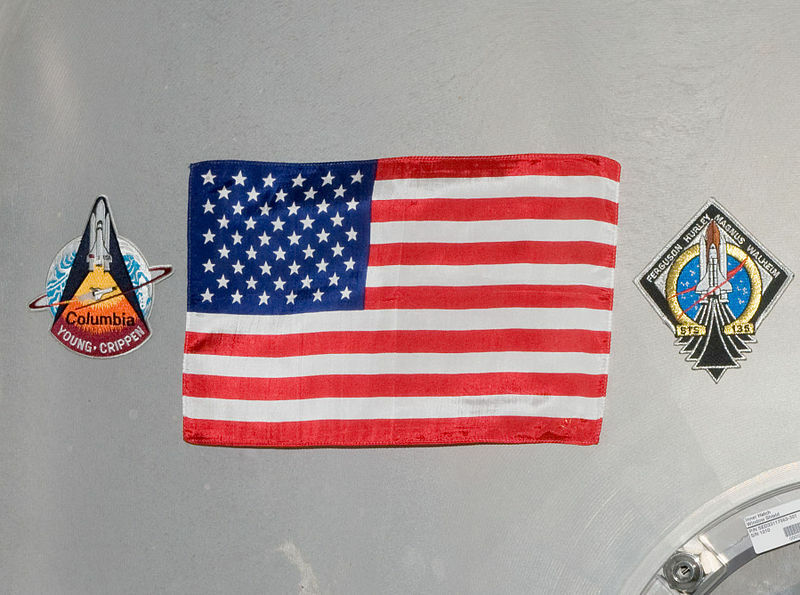 NASA’s inspector general is still gunning for Hanger One. Essentially, the IG and NASA HQ are upset with Ames Research Center’s leasing of property to private groups such as Singularity University, Airship Ventures, and the Google Triumvirate, and insist that future leases correspond to “current or future mission[s]”, and to sell any properties that can’t be leased. I believe the IG is referring in particular to the airfield itself. Not having any particular knowledge beyond what I find in the local papers, but that seems a bit strange. I thought NASA Ames was one of the centers that was researching heavy lift airships for cargo transport to remote areas, and that Hanger One was intended to be used for these airships. 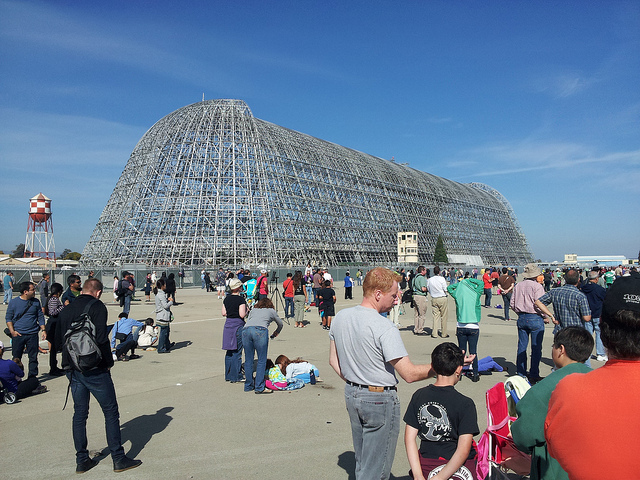 This entry was posted in architecture / furniture, other and tagged hangerone, moffettfield, mountainview, nasa on September 23, 2012 by jonathan. Thursday, September 20, 2012 between 9:00 am and 9:30 am, the Space Shuttle Endeavour is going to make a fly over of NASA Ames on it’s way down to Los Angeles and its destiny of being a museum piece. 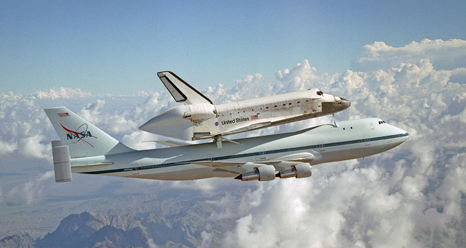 I’ve went to a launch of STS-26, the return-to-flight mission after Challenger, and I saw the shuttle sitting on the 747 at Columbus Air Force Base in Mississippi of all places back in the early 90s. It would be nice to see it in the wild one more time. Shuttle delayed. It’s coming tomorrow (Friday, September 21) at approximately the same time. 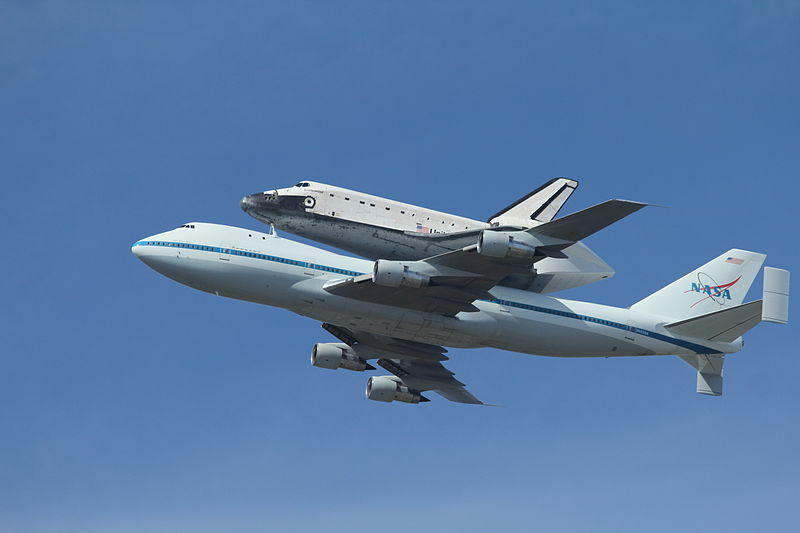 This entry was posted in event and tagged moffettfield, mountainview, nasa, spaceshuttle on September 16, 2012 by jonathan. So the San Jose Night Market has shutdown. 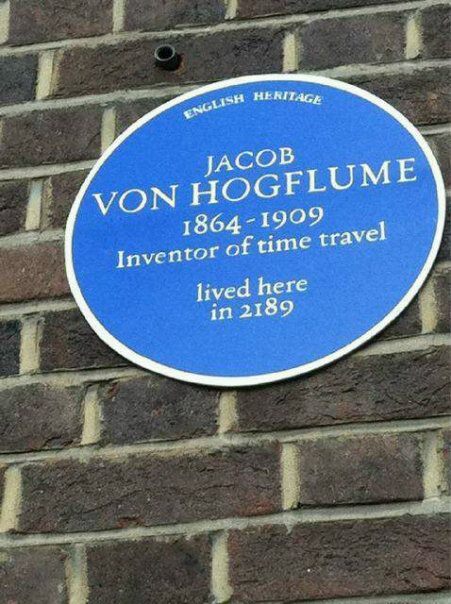 It’s a bit of a shame too. Ming and I went to the second one back in late July or early August. It was interesting, but also a bit disappointing. I knew it was going to be a bunch of food trucks since Movable Feast was organizing it, but I expected a bit more. A bunch of crappy fair t-shirts being sold out of tents wasn’t what I was hoping for, but it was kind of what was there, and what I kind of feared would be there. I don’t regret going, and we talked about going again, but then the market was suspended as they “re-vamped”. Still, the reason why they shut down is just pathetic, and I blame San Jose. Essentially, the city got upset that someone had the audacity to sell food at night, and to use &endash; gasp! &endash; tents! This is “Hello City Planner!”* all over again. I guess this means that next time Ming and I want food trucks, we’ll have to go to Willow Glenn on Fridays. *: It always shocks me that this is an official San Francisco City Planning video. This entry was posted in event and tagged food, foodtrucks, movablefeast, sanjose on September 16, 2012 by jonathan. This entry was posted in illustration and tagged democrats, memes, politics on September 5, 2012 by jonathan. Yes, tumblr is annoying in how it’s basically just photos removed from context, but it is great source for, and an easy way to share random photos from the web. I’m not cross-posting between there and here, but there’s the little widget on the side that give you a flavor of whatever it is I’m into at the moment. This entry was posted in meta and tagged tumblr on September 4, 2012 by jonathan.